You can integrate Office 365 connectors from more than 80 popular third-party apps and services directly into your Yammer group conversations. Connectors can post updates to groups from a wide variety of tools, such as news and social media sources such as Twitter and Bing News, HR systems such as XYZ, and project management tools such as Trello and Asana. 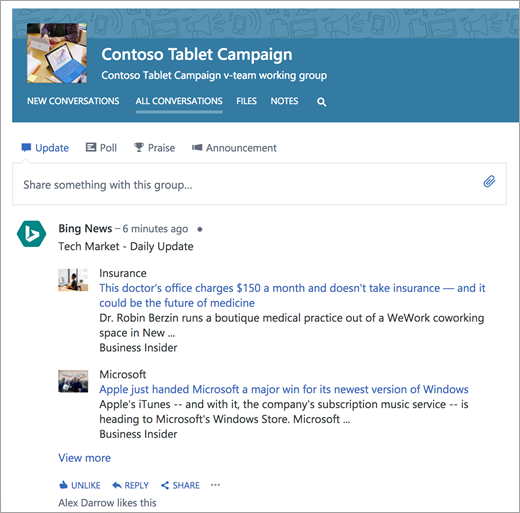 Connectors bring relevant third-party information right to your group. For example, you can set up a news or social connector to deliver a weekly digest of articles or social media posts related to a specific hashtag or search term. Or set up an Incoming Webhook connector to notify your group about activities you want to track from other productivity tools that you use every day. These connectors are only available for Office 365 connected groups. To find out if your group is connected, see Is my group in Yammer connected to Office 365? 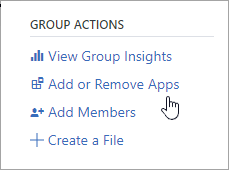 To add and configure connectors for any Office 365 connected Yammer group, click Add or Remove Apps on the right side of the page. Here is a notification of a new connection. Your group now receives updates from third-party services. ﻿Q: Are connectors be available for all groups? A: No. Connectors are available only in Office 365 connected Yammer groups. Q: As an Office 365 admin, how can I control where connectors are available? A: Go to Connect apps to your groups in Outlook for instructions for managing connector availability for your tenant. Q: How can I disable a connector in Yammer? To disable a connector for a specific group in Yammer, you must disable it for all Office 365 apps for that group. For instructions, see Connect apps to your groups in Outlook.